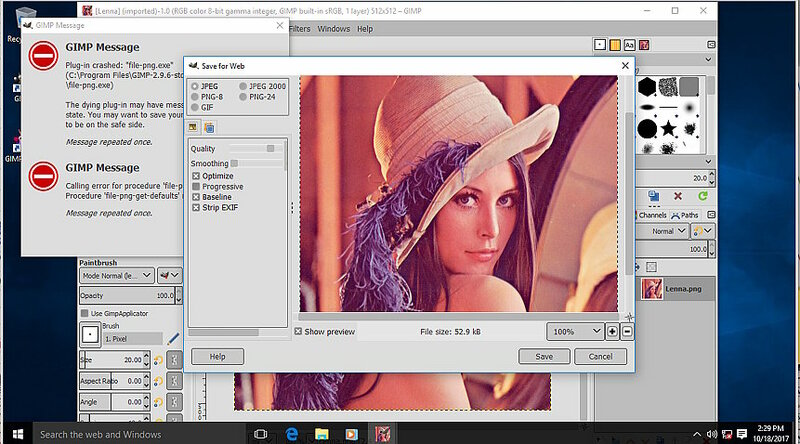 (10-18-2017, 12:52 PM)Dkk Wrote: Hello everyone, I really liked Gimp 2.9.6 but I really need this plugin, would anyone know how to make it work in the new gimp? 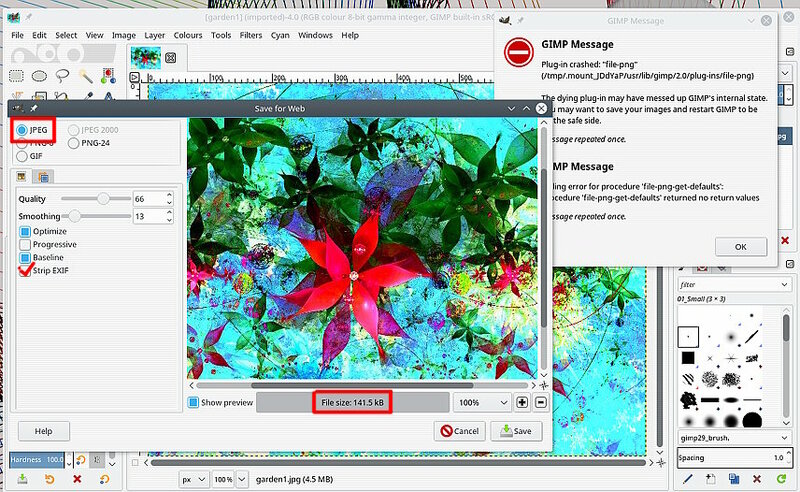 Gimp 2.9.6 so assuming Windows. Unlike Windows Gimp 2.8.x the 2.9 development version does not support 32 bit plugins. I do have a 64 bit Save-for-Web (webexport.exe) - attached, remember to unzip it. This is a really old plugin, the code needs a re-write but I doubt if that will ever happen. Just about works, throws up error messages, not just deprecated warnings but amazingly does export the file. You will have to put up with the error messages. If you do need the linux version, just ask. I would need to export the image to the web. I use Xenialpup 64 7.5 (puppy derived from Ubuntu). I have Gimp 2.9.9 portable (I think that's what you made). If you have the zip file for Linux too I'd be grateful; also because I'm not very experienced with Linux can you show me, if it doesn't take too long, how to integrate "webexporter" in (your) Gimp portable? 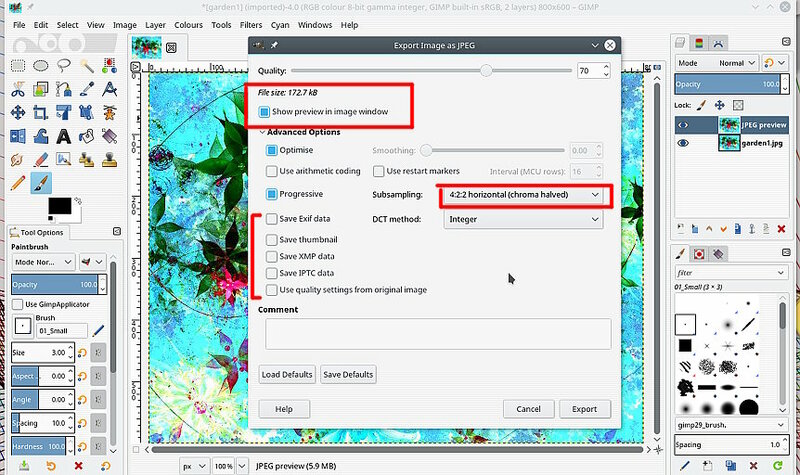 IMHO, the only useful thing in Save-For-Web was to allow you to interactively find the best compromise between image quality and files size, and in 2.10 this is part of the standard JPEG export dialog (just click the "Show preview in image window"). Has the old save-for-web plugin been updated to take in account high precision images? (01-14-2019, 04:24 PM)Ofnuts Wrote: IMHO, the only useful thing in Save-For-Web was to allow you to interactively find the best compromise between image quality and files size, and in 2.10 this is part of the standard JPEG export dialog (just click the "Show preview in image window"). Ohh thank you for the explanation ; but isn't there GIMP 2.10 portable or am I wrong? Otherwise I would use it so - if I understood correctly - I would have everything integrated. Right? (01-14-2019, 03:49 PM)soniabu Wrote: Hi, I'm Sonia. You will only get a jpeg out of it. Just as easy to use the Gimp export jpeg settings. With Show Preview enabled, there is a estimate of file size. With the exif stuff unticked and sub-sampling 4:2:2 the result is much the same as Save for Web. I used Gimp Appimage 2.10.9 and I saw how you write the possibility of rewriting the image. I tried a few minutes ago appimage 2.10.9 as you had already indicated me previously. I like everything about this software. It's complex, but I think it should be like that because it allows you to manage the imagination.